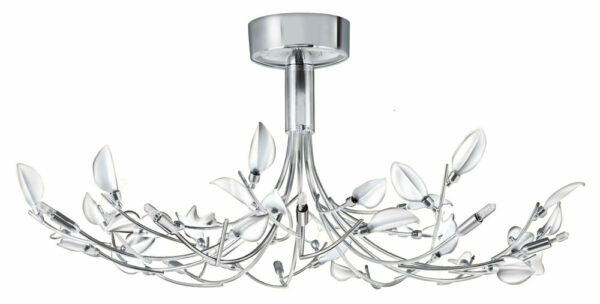 A beautiful chrome finished semi flush contemporary halogen ceiling light stylishly dressed with white glass leaves. Polished chrome ceiling mount and ten twig-like curved arms dropping from the centre. The arms are decorated with white glass leaves and tipped with a low voltage halogen lamp. Part of the Wisteria range of contemporary lighting. A semi flush fitting light that’s perfect for the lower ceiling.